Main Characters: Eragon, Roran, Arya, Murtagh, Ajihad, Saphira, Galbatorix, Ra'zac, Brom, Durza, Horst, Solan, Uncle Garrow, Angela and Orik. Description of One of The Main Characters: Eragon is a poor farm boy. He likes wandering in the spine, the huge range of mountains. He lives in Alagaesia. He gets hold of a dragon egg and become a rider. He names his dragon as Saphira. Later, he kills the shade, Durza. He is the most powerful rider apart from Galbatorix, the evil rider, who is still alive. Whom I like and Why: I like Murtagh as he is a loyal friend of Eragon and helped him after Eragon's teacher, Brom died. He was Morzan, the Forsworn’s son. He once saves Eragon from the shade Durza in Gil'ead. He has a long scar in his back. He is brave and trust worthy. Whom I dislike and Why: I dislike Galbatorix as he is an evil monster. He is a rider, but used his thought badly. He combined his power with his dragon and by making somebody die with pain. He controlled the Shade and Durza and also the Urgals, horned beasts. Setting/Theme of the story: It all starts when Eragon finds a dragon egg, and mistakes it too be a valuable stone, in the spine. As he is a poor farm boy he thinks of earning some money by selling the valuable stone but nobody in Alagaesia wants anything that is from the Spine. So Eragon goes back to his room in Uncle Garrow's house. One night the stone breaks and a Sapphire blue dragon emerges from it. When Eragon touches the dragon, he gets a silver mark in the palm indicating him as a dragon rider. After a few weeks, two Ra'zacs attack uncle Garrow's house and kill him when Eragon and his cousin, Roran, are out. After uncle Garrow's death, Roran sets out to get a job. 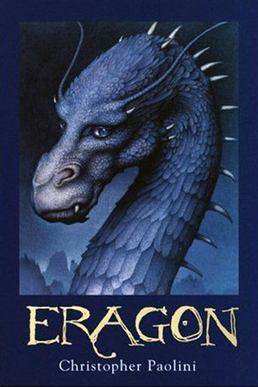 Eragon finds an old story teller named Brom and sets on quest with his advice to defeat the Ra'zacs. On their way Brom teaches Eragon how to fight with a sword and also how to use magic. One day the Ra'zacs attack and kill Brom. Eragon doesn't understand what to do and he wanders helplessly. He finds Murtagh and they both become friends. They go to the Varden and meet the Ajihad. They save the elf Arya from the Shade. They help the Varden fight the Urgals and save Tronjeim, the place where dwarves live. During the fight Eragon kills Durza, the shade and earns th title 'Eragon Shadeslayer' from Arya. He thanks Saphira for combining her power with his.